Frogs are in trouble. A third of all frog species are threatened with extinction. The usual culprits of habitat loss and climate change are at work, but another more insidious threat looms. A devastating disease called chytridiomycosis has been wiping out frogs, often from pristine habitats. The disease is caused by a fungus – amphibian chytrid fungus (pronounced kit-tyrid). The fungus disrupts the skin function of infected frogs leading to cardiac arrest (heart attack). The numbers are sobering. Since the identification of chytrid by Australian researchers in 1998, the pathogen has been documented in over 500 amphibian species, and is now found on all continents (except Antarctica). Fortunately, the pathogen is not universally deadly with some species demonstrating high resistance (though this produces some problems of its own as I’ll explain later). However, many species are highly susceptible and the pathogen has been identified as the primary driver of decline for over 200 species of frog! Consider that for a moment. Enormous effort is put into saving vertebrate species from extinction and when, for example, a microbat, the Christmas Island pipistrelle, went extinct in 2009 there was an enormous outcry. Chytrid is threatening over 200 vertebrate species with extinction. It’s believed that 113 of these species are likely already extinct. Although the origin of chytrid remains uncertain, recent evidence suggests the pathogen may have originated from Brazil and has since been distributed around the globe unwittingly by humans. The earliest record of chytrid in Australia is from a frog specimen in a museum collected in 1978, in south-eastern Queensland. From a potential introduction point of Brisbane, chytrid appears to have spread rapidly both north and south, reaching far north Queensland in the mid-1990s and Tasmania by 2004. The cooler, wetter conditions of the Great Dividing Range have proved highly suitable for the pathogen and its impacts have been severe along the entire east coast of Australia. While chytrid is now present throughout eastern Australia, luckily, it doesn’t tolerate the hot, dry conditions found in many inland regions. Over the past three years we have focused on the long-term impacts of chytrid on frogs of the Australian High Country – a region that is home to several frog species found nowhere else in the world. In the mid-1980s mysterious frog declines were reported from the region and, with the benefit of hindsight and retrospective museum sampling, we can now be confident that these declines were caused by the initial emergence of chytrid. 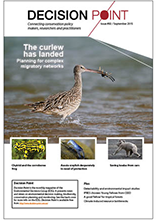 In conjunction with Threatened Species Manager David Hunter from the NSW Office of Environment and Heritage we have examined population trends of susceptible species and the ongoing threat posed by chytrid three decades after its emergence. Broadly speaking, impacted frog species can be classified into three groups: declining, stable and recovering’. Let’s get the bad news out of the way first. Worryingly, some species are in a continued state of decline, being pushed closer and closer to extinction every day. These declining species include some of our most iconic fauna, the corroboree frogs. 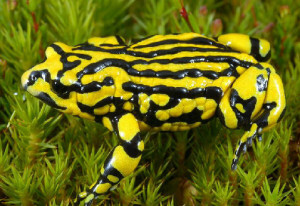 The northern corroboree frog was once highly abundant in Kosciuszko and Namadgi National Parks. In the 1980s, populations were decimated by chytrid, with dramatic declines and many local extinctions. Seemingly overnight, chytrid almost turned the lights off on the northern corroboree frog; this in highly protected habitat. However, as with many other chytrid-affected species, a handful of remnant populations survived. Unfortunately for the northern corroboree frog, the common eastern froglet – a highly resistant species – also remains abundant at these sites. In ongoing research, we have shown that the common eastern froglet acts as a reservoir host – a species that carries infection, but is rarely killed by disease. The presence of a reservoir host amplifies the impact of the disease in corroboree frog populations and drives ongoing declines. Although the prognosis for the corroboree species is alarming, understanding the mechanism controlling chytrid dynamics is facilitating the development of innovative management strategies. many being explored to overcome the challenge of chytrid. While it is clear that some species are in an ongoing state of decline, for other species, such as the endangered alpine tree frog, the situation appears a little better. The alpine tree frog experienced a similar pattern of decline to the corroboree frogs. Remnant populations of alpine tree frogs, however, now appear relatively stable despite the continued presence of chytrid. Studying these populations, we have found that their persistence is facilitated by high juvenile frog recruitment (Scheele et al, 2015). During the breeding season, the prevalence of chytrid can exceed 90% in adults, resulting in very low survival between years. Crucially though, the pathogen is rare in tadpoles and juvenile frogs. This allows the next generation to disperse into woodland habitat free of the disease. Because chytrid is an aquatic pathogen, individuals have low risk of becoming infected in terrestrial environments. However, when individuals reach sexual maturity they re-turn to wetlands to breed and subsequently become infected. Luckily, adults are able to breed prior to succumbing to the disease. Although the impact of chytrid has been horrendous, it’s not all bad news. In the foothills of the Snowy Mountains, the whistling tree frog, a close relative of the alpine tree frog, is bouncing back (Scheele et al, 2014a). Surveys in the 1970s found that whistling tree frogs were ubiquitous on the NSW southern tablelands; if there was a pond or farm dam, they were just there. Like so many other species, whistling tree frog populations crashed in the 1980s and the species was considered rare in the Canberra region by the early 1990s. When we commenced our surveys in 2011, we found that the species was present in many areas where it was absent two decades earlier. Ongoing surveys in 2012 and 2013 demonstrated that, year by year, the species is re-expanding into habitat occupied decades ago. Whilst more work remains to be done on the mechanism facilitating recovery (chytrid prevalence remains high and appears to drive high adult mortality), we found that sites that retained frogs during the cycle of population decline and recovery had high quality habitat. This highlights the potential for habitat to buffer species from novel shocks. In Australia, some frog species are in an ongoing state of decline due to chytridiomycosis. Without conservation interventions, the number of Australian species driven to extinction by chytridiomycosis will almost certainly rise. While preserving habitat is crucial, it is not enough on its own to mitigate the effects chytrid fungus on many species. Appropriate and complementary direct action is also required. Building on our field research and a review of the international literature, we developed a framework to help guide the management of chytrid-threatened species (Scheele et al, 2014b). Within our framework, we identified two broad management approaches: 1. reducing chytrid fungus in the environment or on amphibians and 2. increasing the capacity of populations to persist despite increased mortality from disease. At a national level, a whole raft of measures ranging from investigating frog capacity for evolved resistance to assisted translocation into environments with low disease suitability are needed to combat chytrid fungus. Responding to the chytrid threat has appeared extremely daunting over the last 15 years. However, our research indicates we are now at a turning point, with the potential to make real progress in the management of this terrible disease. The southern corroboree frog is a small, vividly-coloured species restricted to Kosciuszko National Park, in south-east NSW. It breeds throughout summer. 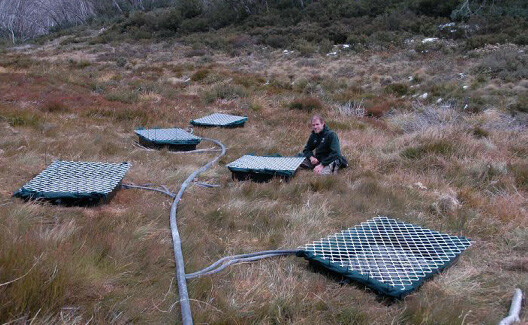 Males call from moist terrestrial nest chambers, typically around the edge of pools in sphagnum bogs. The eggs wait for autumn rains or snow melt before the tadpoles hatch and enter the pools. Adapted to life in cooler climates, this species may take three to five years to mature and can live for at least nine years. Its striking yellow and black longitudinal markings make it one of Australia’s most easily recognised frogs. They also warn potential predators of lethal alkaloids within its skin. But even with no known predators and a distribution almost entirely within a pristine wilderness area, thanks to chytrid the southern corroboree frog is one of Australia’s most threatened vertebrates. Assessing which management strategies are most suitable for a given frog species depends on a detailed understanding of chytrid dynamics and frog species ecology. Interventions against chytrid should target amphibian life history stages most affected by disease or at high risk of chytrid exposure. Ecological surveys are needed to identify outbreaks, ongoing declines, and prioritize high-risk populations. For most species, a variety of approaches implemented at different spatial scales will be necessary. Given the lack of proven effective strategies, all interventions should be implemented within an experimental framework. To optimize progress, research aimed at understanding the mechanisms underlying interventions should occur concurrently with their application. Scheele, BC, DA Hunter, L Grogan, L Berger, J Kolby, M McFadden, G Marantelli, LF Skerratt, and DA Driscoll. 2014a. Interventions for reducing extinction risk in chytridiomycosis-threatened amphibians. Conservation Biology 28:1195–1205. Scheele, BC, F Guarino, W Osborne, DA Hunter, LF Skerratt, and DA. Driscoll. 2014b. Decline and re-expansion of an amphibian with high prevalence of chytrid fungus. Biological Conservation 170:86-91. Scheele, BC, DA Hunter, LF Skerratt, LA Brannelly, and DA Driscoll. 2015. Low impact of chytridiomycosis on frog recruitment enables persistence in refuges despite high adult mortality. Biological Conservation 182:36-43.